Indicates events sponsored by the Golden Gate Austin Healey Club. The 100%er Club has been created to recognize club members that participate in ALL OFFICIAL CLUB ACTIVITIES. 100%er Club members will be recognized at the 2018 Christmas Party. The club is going to revive Club Member Name Badges but you MUST QUALIFY by participating in 5 official club events. An Annual Mileage Award will be presented at the 2018 Christmas Party to the club member that drives their Healey the most during the year. The Events Coordinator will record your odometer mileage at the first event you attend for the year. What: This will be a fun tour beginning with the rendezvous at the Starbucks in Morgan Hill located at 17015 Walnut Grove Ave.
From there we will cruise the eastern side of the Santa Clara Valley, skirting Hollister to continue south east to the DeRose Winery and Car Museum. The winery is located on the San Andreas fault and is home to some of the oldest vines in California. Optional Wine tasting will be available at a discounted rate of $5 per person and wine purchases will be available at the membership price. 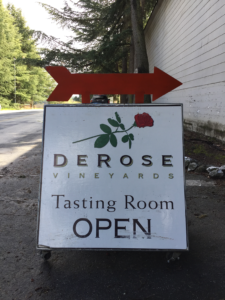 The winery also sports a small non-profit car museum and for a $5 donation we will have access to interesting docent led tours through the cars. After the visit at the winery the tour will continue south east, eventually joining Highway 25, in the Hollister Valley. Traveling now north west we will arrive at Tres Pinos for lunch at the 19th Hole, a historic building with great atmosphere and food. Afterwards, the drive continues to Suncoast Organic Farm where they have great scenery and marvelous baked goods providing an opportunity for dessert!! There is an additional, optional, on your own opportunity to continue into the historic town of San Juan Bautista where they are hosting a Chili Cook off, Indian Craft Show and History Days at the Historical State Park. Don’t forget that this is Kentucky Derby Day so a drop into a watering hole somewhere to watch the Run for The Roses may be in order! Post time approximately 3:50 pm PDT. And that’s not all!! To add to the fun the Santa Cruz British Motorcar Club has been invited to join us! More info: Please RSVP by April 19th to Ginny Brown at ginnfrnkln@comcast.net. What: Drive Highway 49 to discover the true gold of California. This drive starts modestly but ends with a big payoff! The real drive begins by turning north onto the Golden Chain Highway (Highway 49) through the heart of The Mother Lode. From the start the drive is beautiful and historic. We’ll make a stop at Jamestown for lunch and a 45-minute ride on a steam train at Railtown 1897 State Historic Park ($15 per adult). Then we’ll head north through Sonora, Angels Camp, San Andreas, Mokelumne Hill, stopping for the night in Jackson. We’ll stay at The National Hotel (http://www.nationalhoteljackson.com/) at 2 Water St, Jackson, CA 95642. After dinner at Stanley’s Steakhouse we can visit the many quaint and historic shops in Old Town Jackson or you can just tuck-in for a quiet evening. If you’re up for an After Party, some of us will continue north on Highway 49 through Grass Valley and Nevada City heading east on Highway 20 through more gorgeous scenery to Yuba Pass where we’ll pick up Highway 80 again. 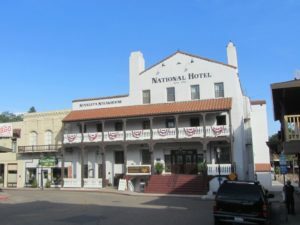 More info: Make National Hotel reservations at https://reservations.nationalhoteljackson.com/asp/IQHome.asp or by calling 209-223-0500. Make sure to indicate you’re with GGAHC in the Special Instructions on the reservation form or over the phone to get preferred room rates which are between $112.50 (for a Double) and $135 (King). We’ll gather at the Starbucks in Modesto at 3801 Yosemite Blvd Suite 4, Modesto, CA 95357 at 9:30 AM, leaving at 10:00 SHARP. There are several nearby gas stations so please fill up before 9:30. If you’re coming, Please RSVP to events.ggahc@gmail.com by June 16th. What: Drive from Mt. Tamalpais to to the Marin Rod & Gun Club for their car show. What: A short drive from a sports car oriented winery to Club member Ken Nerlove’s Elkhorn Peak Winery for socializing and a BBQ. What: These events have been a great way to show off our Healeys to the public and to socialize over ice cream. Bring your grandchildren and let them know what Healeys are all about. Be ‘sociable’ and show up for “National Ice Cream Social 2019”. If you RSVP to Len ahead of time, and show up with your Healey, you get a discount on ice cream! SAVE THE DATE!! If you are new to the event or have not provided it before, please let Len know the year. make, model (AH, JH, NH, Sprite, etc) (MKx, Axx, Bxx where applicable). Remember – no RSVP, no Healey, NO free Ice Cream. But come anyway to join fellow Healey owners in our annual ritual!! What: A backroads drive of Contra Costa County, including Port Costa and Port Chicago. What: The Lodi Wine Region was named Wine Region of the Year for 2015 by Wine Enthusiast Magazine. With 85+ Lodi wineries, Lodi wine country offers an amazing variety of tasting opportunities. We won’t visit them all in one day, but David Nock will lead us to his favorites. Visitors will find Lodi wine tasting rooms large and small, brand new and decades old. Although variety is abundant, one constant remains: the Lodi wine experience. Visitors to Lodi wineries will often find themselves sipping Lodi wine with a fourth-or-fifth generation winemaker, who is passionate about his/her product. What: A backroads drive of beautiful Portola Valley, San Mateo County. fill it out completely and mail back with the entry fee no later than January 10, 2019. More info: Online at californiamille.com/california_mille/. What: On the First Sunday of every month, automotive enthusiasts gather in front of Starbuck’s in the Vintage Oaks Shopping Center Novato, California to share their vehicles and admire the other fabulous classics, exotics, rods and anything else with wheels and a motor. This has become a HUGE event and now commonly has well over 200 cars, ranging from serious vintage to modern. First Sunday of each month, from 8-10 am, though many spaces fill by 7:30. This is a great gathering of cars and car fans. FREE—no charge, no registration. The first Sunday of every month, rain or shine, in front of Starbucks in the Vintage Oaks Shopping Center Novato, California. 8:00 in the morning to 10:00 am. Arrive when you want. Check your ego at the stop sign. It’s free! Excluding your Starbucks purchases! Please do patronize the local stores! Leave when you want. BUT, behave yourself! No burnouts, no running over pedestrians, no sudden left turns into center dividers. Seriously, you won’t impress anyone and the other 100+ cars owners will not take kindly to any attempt you might make to screw up this event. Photographs will be taken of your car.Many of these photographs (including personalized license plates) will find their way to the web. The Marin Cars and Coffee Facebook page posts pictures, monthly, that participants may continue to revel in the experience and to allow others, who missed attending, to fill this void in their lives. This is a family friendly get-together. There is a welcomed police presence (hint, hint). Enjoy yourself! This is a wonderful assembly of diverse car owning folks! Lots to see and lots to learn! What: Mark your calendar now, don’t miss the next great California Healey Week hosted by the Austin Healey Association of Southern California. Full details and Registration information will be forthcoming soon, but this promises to be a fun filled Healey Week with all your favorite activities with a few new twists. • This will be an “all weekday” event resulting in far lower hotel room rates. • The Temecula Valley offers a myriad of entertainment opportunities from wineries to casinos, hot air ballooning and golf. • Average high temperature in May is 77 degrees. • Plenty of beautiful backroads for our poker run and scenic tour drives. • Car Show in Old Town Temecula with tons of shopping and dining options and lots of foot traffic. More info: Online at AHA of SoCal. ROOMS ARE SELLING OUT, PLEASE REGISTER AND BOOK NOW! What: This amazing show, held on the site of the Dixon fairgrounds, is a fantastic place to see and be seen with all forms of British cars and motorbikes! Stroll the grounds and bond with your fellow enthusiasts, as you peruse the finest offerings of British motoring. And you don’t need to be a secret agent to find what you need in our swap meet, filled with all sorts of new and used parts, cars and accessories. So keep up the British end and register your vehicle now to join the largest gathering of British motoring in Northern California. More info: Online at www.ubscc.org/CarShow.htm. What: British Car Week is an annual awareness week intended for owners of Classic British Cars to get their cars out of the garage and drive them. While doing so, all who are involved will help create awareness of the classic British car hobby in local communities wherever there is participation. More Info: Online at www.britishcarweek.org/. What: The inaugural Sonoma Speed Festival combines an extraordinary group of historic vintage racing cars, for a celebration of flat-out wheel-to-wheel racing, May 30-June 2, 2019. Illustrious Sonoma Raceway, in the heart of California’s Wine Country, is one of the worlds most well known and challenging race tracks. More info: Online at www.sonomaspeedfestival.com. What: The Cascade Austin Healey Club of Washington will be hosting the 2019 Rendezvous at Campbell’s Resort on Lake Chelan, Washington. What: The Classic Motor Rally is an annual celebration of classic cars. It is conducted over a summer weekend and the next one will begin in Wilsonville, Oregon. The destination of the 2019 edition is Cottage Grove, Oregon, at the southern end of the Willamette Valley, and the dates are June 28-30. The event is organized around a traditional time-speed-distance rally and comprised of pre-1990 collector cars and their enthusiastic owners. We also offer the option to drive the event as a non-competitive tour in your favorite touring car of any vintage. More info: Online at classicmotorrally.org. What: The Santa Cruz British Motorcar Club (SCBMC) invites all GGAHC members to this multi-club event. 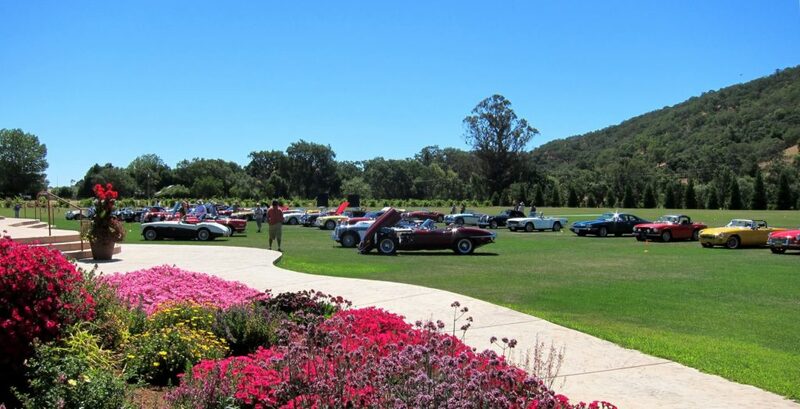 This fun day, planned by Bob & Judy Petrokas of SCBMC, will be a relaxed tour to the Kirigin Winery in Gilroy, followed by a car show staged on the Winery’s beautiful flowering lawns, wine tasting, winery tour and lunch (including Vino de Mocca Sundae). There were 74 participants and over 40 British cars involved in the full day of activities for the first Kirigin event in 2016 and we expect 100 this year. The morning drives, which start in Los Gatos and one in Watsonville on the coast, will meander through relaxing country roads for over one hour before converging at Kirigin Cellars just outside Gilroy. Once there, the cars will be placed on the lush lawn in a semi-circular fashion in front of the Kirigin Club House. The grounds at Kirigin are covered with beautiful flowering landscaping and more plants decorating the outdoor, arbor-covered dining patios. There will be two morning walking tours of the winery for attendees and in between, everyone will be busy tasting the terrific complimentary wines of Kirigin Cellars. A buffet luncheon is served of different salads, gourmet sandwich selections, ranch beans, beverages and finishing with a Vino de Mocca Sundae. This full day of touring, wine tasting, concours, luncheon and wine awards is all done for the bargain price of $35 per person. Thanks to Bob Petrokas and Kirigin Cellars. After the luncheon, organizer Bob & Judy Petrokas will present the bottles of wine to the outstanding cars of the day. All bottled wine selections will be on sale for 50% off! At the last event at Kirigin Cellars in 2016, many people commented on how much they enjoyed meeting the many British car fans attending from the different area clubs. The consensus was it would be great if all the British car clubs could do more of these joint events, bringing together more owners to keep the British sports car hobby flourishing and fun. More Info: Advance registration by Paypal, all inclusive payment of $35 per person includes: Tour, Show on Lawn, Wine tasting, choice of Lunch, desert and bottled wine awards for the 6 best cars (all marques). Register by June 1st with Bill Meade, SCBMC at billmeade@charter net. Over 100 participants expected, sign up immediately to not miss out. What: The Hillsborough Concours offers a forum for passionate vintage car owners to showcase their prized vehicles and to compete for respect and recognition for their commitment to preserving automotive authenticity. The Concours also aims to cultivate future generations of car enthusiasts by providing privileged access to some of the world’s most celebrated automobiles and by serving as a channel for inspiring and informative automotive knowledge and lore. More Info: Online at www.hillsboroughconcours.org. What: Monterey Car Week is not to be missed in 2019. This special automotive week is full of exciting events, auto shows, rallies, concours and car auctions that ends on Sunday at the Pebble Beach Concours d’Elegance. More info: Online at whatsupmonterey.com/events/monterey-car-week. September 6 to 11: Black Hills Conclave 2019 – Note the Date Change!! What: The AHCA membership has been asking for a Conclave outside the heat of the summer months for years, so …. The Minnesota AHC will be hosting Conclave 2019 in Deadwood, South Dakota, September 6 to 11, 2019. Deadwood is about 1,400 from San Francisco. Yes, that is a pretty long haul for sure, but given the “freshness” of the roads and the region – in being little-known territory to Healey owners – there might be some number of owners from the far west who would like to make the trek and see those new-to-them roads and sights despite the distances involved. More info: Online at Conclave 2019. What: Join the Danville d’Elegance Foundation on Sunday when the streets of historic downtown Danville will overflow with the sights, sounds and smells of classic, sports performance and exotic automobiles, as well as fine wooden yachts and cruisers, motorcycles and vintage trailers, for the annual Danville Concours d‘Elegance. Come see Old Town Danville (Hartz Avenue) at its annual finest, for a full day of vehicle displays, fine food, wine tasting including some of the finest Napa wines, a silent auction, and raffles in a relaxed environment. – It‘s fun for the whole family! This gathering is designed to raise funds for Parkinson’s Disease research and patient care. Join us to enjoy the day and help us “Stop Parkinson’s in its Tracks”. More Info: Online at www.danville-delegance.org. What: The Ironstone Concours d’Elegance is an antique and classic car show that takes place each year at Ironstone Vineyards, 1894 Six Mile Road, Murphys CA 95247. Some 300+ antique and classic cars participate in the Ironstone Concours d’Elegance. This e show also features vintage trailers, motorcycles and wooden boats. Since 1996, the Ironstone Concours Foundation has held the Ironstone Concours d’ Elegance. Our events have resulted in more than $750,000 of donations made to support youth in agriculture, including Future Farmers of America (FFA) and 4-H youth activities. More info: Online at www.ironstoneconcours.org. What: Since its inception in 2004, the CSRG Charity Challenge raised $910,000 for critical work supporting the success and wellness of Sonoma’s children. We are on the road to $1million and in partnership with Sonoma Raceway, the help of our drivers, guests and volunteers we are determined to get there. From broken homes to childhood cancer, every dollar helps. More Info: Online at www.charityracing.org. What: The Annual British Fall Classic automobile show will be held in beautiful downtown Morgan Hill. The British Fall Classic is brought to you by On the Road Again Classics of Morgan Hill, specializing in the restoration of British Motorcars. More info: Online at www.thebritishfallclassic.com. What: GGAHC, Austin Healey Association of Southern California (AHASC), and Austin Healey Club USA (AHCUSA) will host the 45th Austin Healey Rendezvous. Save the Date and Stay Tuned! ROOMS ARE SELLING OUT, PLEASE REGISTER AND BOOK NOW! Go to UK Healey events for the year-round schedule of the Austin Healey Club UK.